The Holy Family with Saint Elizabeth and the Infant Saint John the Baptist was dated by Thuiller to between 1653 and 1657. Anthony Blunt suggested a later date of around 1660–70, locating it in the artist’s last phase. In 1652 Sébastien Bourdon moved to Stockholm on the invitation of Queen Christina of Sweden, focusing most actively on portraiture during that period. In 1654 he was again in Paris where he was appointed rector of the Academy. The following year he was again in Montpellier, returning to Paris in 1658. Dating from that time is the tapestry cartoon of The Beheading of Saint Protasius, painted for the church of Saint-Gervais in Paris and now in the Musée de Beaux-Arts in Arrias, and the oil of The Fall of Simon Magus for the cathedral of Saint Peter in Montpellier. Bourdon’s oeuvre encompasses all the principal pictorial genres while he was also a highly gifted printmaker and draughtsman. 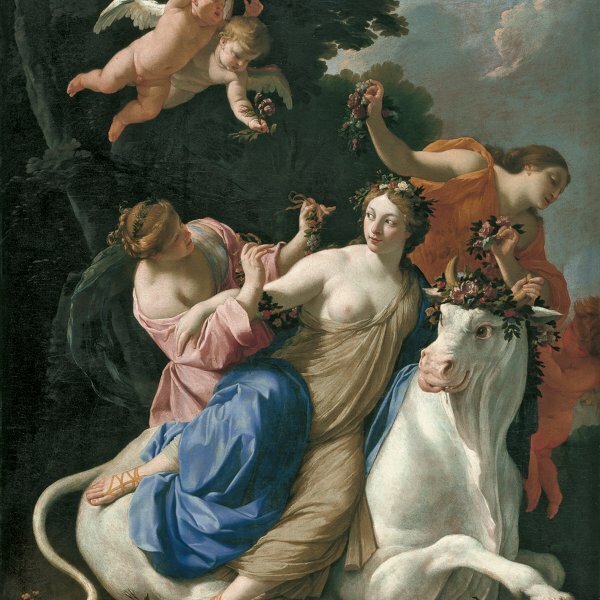 His versatile style reveals the influence of Van Dyck in his portraits, and of Nicolas Poussin. The latter’s influence is evident throughout Bourdon’s career, particularly in the 1640s when Poussin was in Paris. The present canvas was considered by Blunt to be: “an exceptionally good example of what we should consider his best and most individual style. 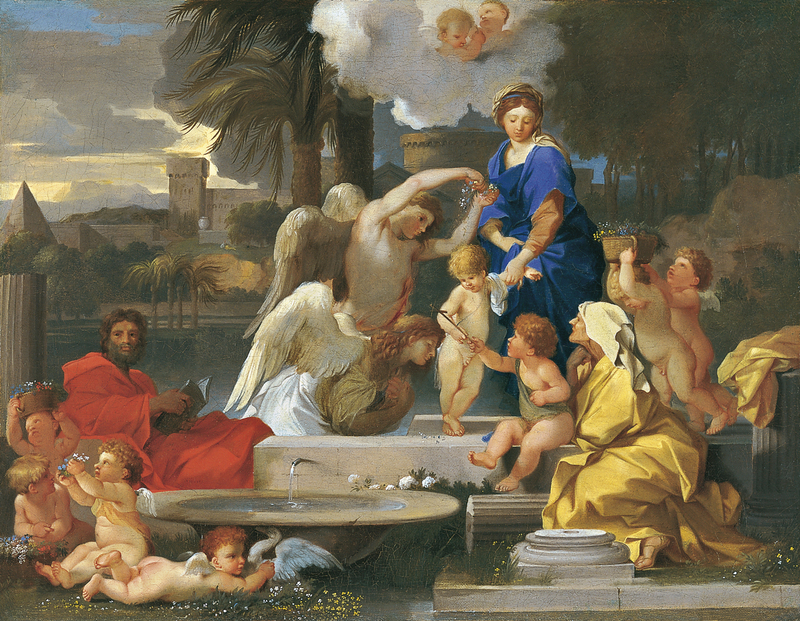 In it he translates various elements derived from Poussin’s Holy Families into a more elegant form with a fresh colouring that is totally his own”. The canvas, with its geometrical composition, can be considered classicising in approach due to the treatment of the landscape, figures and composition. Bourdon depicts the Holy Family with Saint Joseph set apart to the left and seated on the ground holding a book. The principal group of figures is located on the outskirts of a city and is surrounded by cherubim and angels who amuse themselves collecting wild flowers which they offer to the Christ Child. In addition, Bourdon includes Saint Elizabeth and the infant John the Baptist who offers his cross to the Infant Christ in a reference to Christ’s future sacrifice. Classical motifs in the form of architectural fragment are prominent in the foreground, while the inclusion of exotic elements in the background serves to evoke an oriental city. Some of the figures’ poses and gestures, such as that of Saint John offering the cross to Christ, or those of Joseph and Saint Elizabeth, are to be seen in the canvas now in the Musée Magnin in Dijon which is earlier than the present work. Two copies are known of this composition, one on copper (location unknown) and the other in the Smith College Museum of Art, Northampton. There is an engraving based on the painting by Michel Natalis. The present canvas, which entered the Thyssen-Bornemisza collection in 1982, formerly belonged to Sir Kenneth Clark.